Removing the power supply is a hot-plug operation. You do not need to power off the server before you remove the power supply. 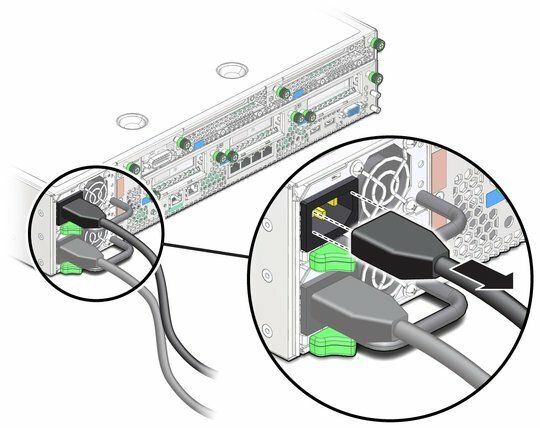 Note - The server can still function with one power supply, however removing both power supplies effectively powers off the server. If you have not prepared for service, do so now. See Preparing for Service. If you are removing the power supply as part of another component's removal or installation procedure, go to Step 2. Determine which power supply to remove. See Locate a Faulty Power Supply. Disconnect the power cord from the power supply. Move the release tab to the right and pull on the handle (pane 1). Continue to pull on the handle to slide the power supply out of the chassis (pane 2). When the power supply is almost free of the chassis, use your other hand to support the weight of the power supply. Set the power supply aside. If you removed the power supply as part of a replacement operation, install a new power supply. See Install a Power Supply. If you removed the power supply as part of another component's removal or installation procedure, return to that procedure. See Component Service Task Reference for assistance. 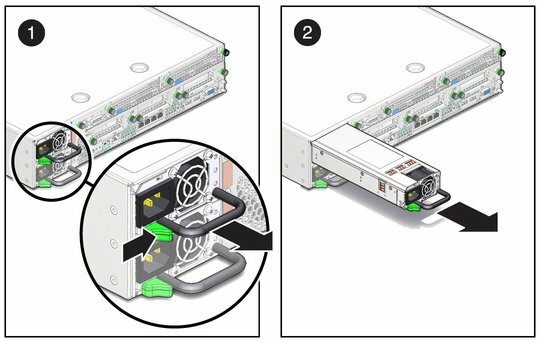 If you are not replacing the power supply, go to Step 9.